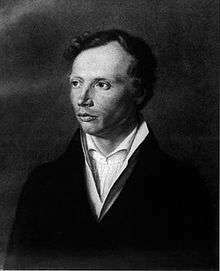 Johann Ludwig Uhland (26 April 1787 – 13 November 1862), was a German poet, philologist and literary historian. He was born in Tübingen, Württemberg, and studied jurisprudence at the university there, but also took an interest in medieval literature, especially old German and French poetry. Having graduated as a doctor of laws in 1810, he went to Paris for eight months to continue his studies of poetry; and from 1812 to 1814 he worked as a lawyer in Stuttgart, in the bureau of the minister of justice. In 1815, Württemberg was to be granted a new constitution, replacing the old constitution of the Estates of Württemberg (Landstände) which had been abolished in 1806. Uhland became a prominent proponent of the old rights of the estates during the controversy of the following years, which ended in a compromise in 1819 under William I of Württemberg. Uhland went on to serve in the newly created parliament (Landtag) from 1819 until 1826. One of his best-known poems is "Ich hatt' einen Kameraden", which is an integral part of military funerals. Chisholm, Hugh, ed. (1911). "Uhland, Johann Ludwig". Encyclopædia Britannica (11th ed.). Cambridge University Press. Gilman, D. C.; Thurston, H. T.; Colby, F. M., eds. (1905). "Uhland, Johann". New International Encyclopedia (1st ed.). New York: Dodd, Mead. Ripley, George; Dana, Charles A., eds. (1879). "Uhland, Johann Ludwig". The American Cyclopædia.